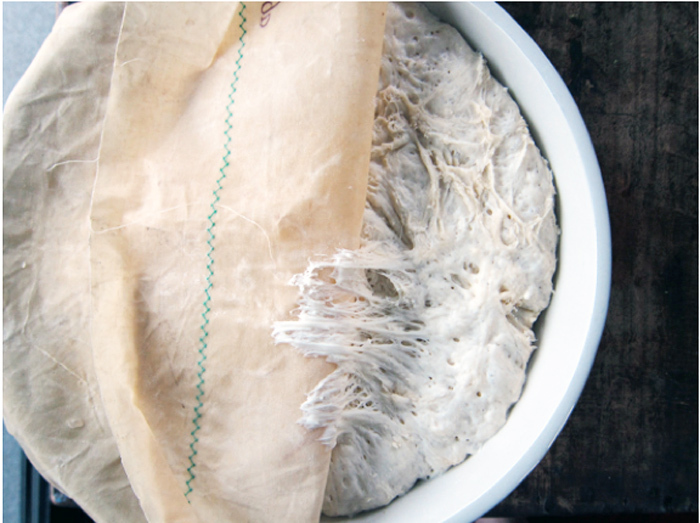 Making bread shouldn't be as complicated as it seems. It should be something that anyone can make, regardless of baking skill. That's why I like this recipe from the New York Times from Jeff Zertzberg and Zoe Francois. Maybe you've already made the artisan loaf known famously as No-Knead Bread, but this one is different. 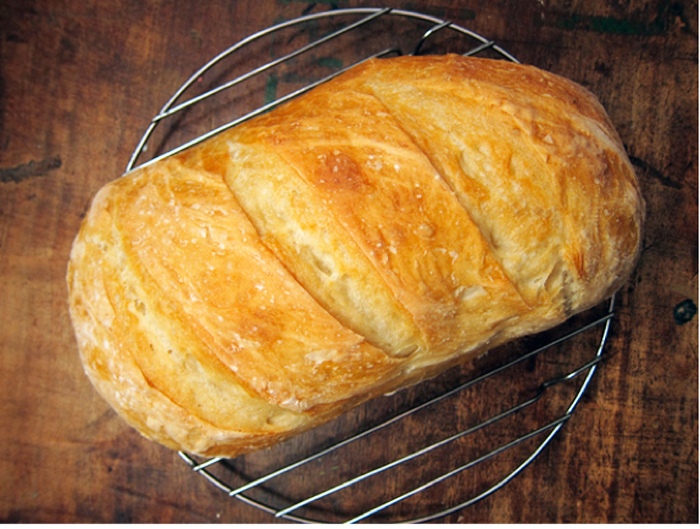 It's less time consuming - in 3 hours, from mixing to baking, you can have freshly baked bread. There's no waiting overnight and luckily there's no kneading either. I should mention that I like the No-Knead bread better - it's got a more artisanal quality. 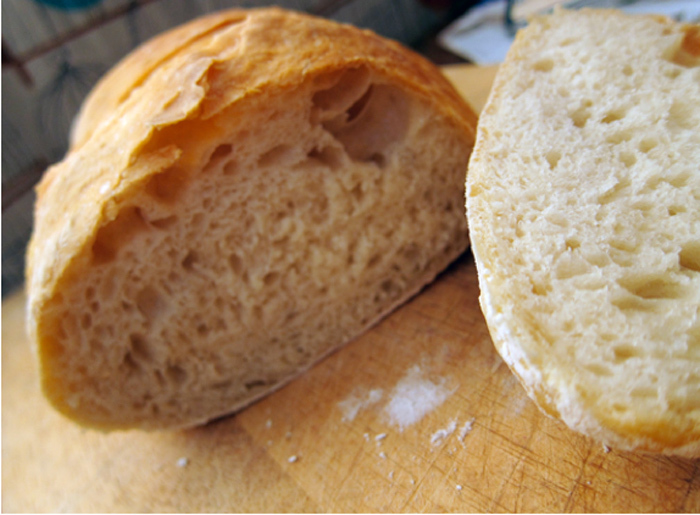 The crumb and flavour is a bit more pronounced and the crust is really wonderful. But this bread is no slouch either. I mean, look at it! Maybe if your grandmother made bread every week, this might be similar. At least that's what my husband thought when he bit into his first slice of this bread: "It tastes just like the bread my grandma made!" And it is tasty bread. It smells amazing when it's in the oven. It looks lovely out of the oven with it's golden-hued crust. It's delicious eating this toasted up with butter and jam for breakfast. But maybe what I like best about this recipe is that it's an excellent recipe to test out your burgeoning bread-chops. While this loaf of bread might not be the best bread I've ever made, it is by far the easiest, and sometimes, easy is exactly what is needed. In a large bowl, mix yeast and salt into 3 cups of warm water (about 100F). 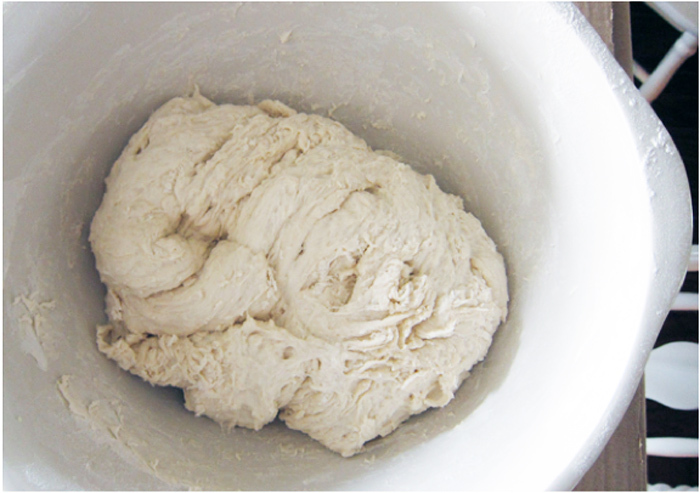 Stir in flour and mix until there are no dry patches (see photo below for what this dough should look like). Use a sturdy spoon, my wooden spoon broke while mixing this dough! Oops! Divide the dough in half, or in quarters if you like. 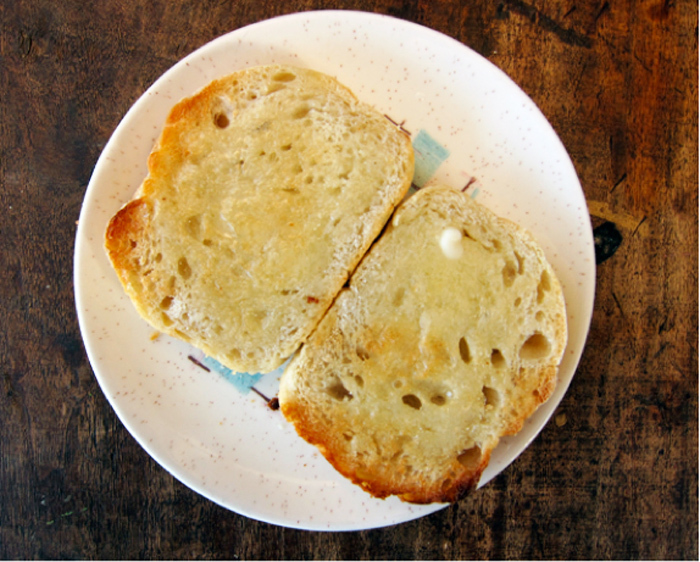 I divided my dough in half, shaping one half into a oval bread shape, turning it in my hands to stretch the surface, creating a smooth top and a lumpy bottom. Put dough on a baking sheet covered cornmeal and parchment (or use a pizza peel sprinkled with cornmeal) and let it rest for 40 minutes. I cut the remaining half of dough into 2 and smoothed and stretched the balls and placed them each into 2 well-buttered loaf pans to rise for 40 minutes. If you don't want to use your dough right away, refrigerate it. While the dough is relaxing, heat oven to 450F and place a large roasting or broiler pan on the bottom shelf of your oven. If you're using a pizza stone, place it in the oven for 20 minutes to heat up. Place the other oven rack in the middle of the oven. Meanwhile, boil up a full kettle of water. Dust the dough with flour, slash the top with a serrated knife three times. When the water has boiled, carefully pour the water into the hot roasting/broiler pan and immediately pop the bread loaves into the middle oven rack, closing the door quickly to trap the steam. Bake until well browned, about 30 minutes. Cool completely and dig in. this looks delicious! i know what i'll be making in a few minutes... and I'm sure my sick kiddo will enjoy it... yep fever ridden 16 year olds have a tendency to wake up ravenous! I just made this in three loaves. OMG! So good!! My daughter and I almost finished a whole half a loaf ourselves. We dipped it in my olive oil and balsamic vinegar that I just got from a new store called The Land of Olive Oil & More in Skippack PA. Can't wait for the rest of the family to have some! Must make more tomorrow to share! I was just about to head to the bakery to get some bread for reuben sandwiches tonight. Now I have a bowl of dough rising on the counter! Perfect timing - thanks! Mine is rising as I type! I can't wait, hopefully we'll be eating some dressed as garlic bread with our dinner tonight! I have small loaf pans from ikea (9 1/2x 4 1/2)..would work for this recipe? I've never made bread before and would love to try! Julia, I used 2 pans that I just got at IKEA that are 11.5 X 4 and they fit perfect with a little room to spare so your's might work good. They'll just be a little taller. Good luck! Mostly Noodles and Sarah - let us know how it turns out! Wow - Q - that was fast! - Yay! Julia - I'll check with Jeannette! Yes, Julia, you can make them in the small loaf pans, just use smaller dough balls - maybe cut your dough into 4-6 pieces. Good luck! It turned out great! Our garlic butter was a bit strong LOL, but the bread part was awesome. Thanks for this recipe! This looks beautiful. Can't wait to try it. My dough came out very watery. Do you think I did not mix it enough? Or that I didn't add enough flour? It rose nicely but when I tried to divide the dough it was pretty runny! Hi Anonymous, the dough shouldn't be runny at all - I broke my wooden spoon on it :) 3 cups of water to 6.5 cups of flour should be the perfect ratio. Maybe you added not enough flour or too much water? Try baking it and see how it turns out & try again! This is seriously the best quick bread ever. I will make this in the a.m. to have for dinner. Love it!! awesome post jeannette! i am totally baking this bread this weekend. funny i was just talking about taste memories with some friends, and how even if you try to make a recipe that was your grandma's or whomever's, it often doesn't taste the same because of those tiny little touches someone does when they're baking or cooking... pretty great that cornelius thought it tasted just like his grandma's! food/taste memories are the best!!! I can't believe it takes 3 ingredients!